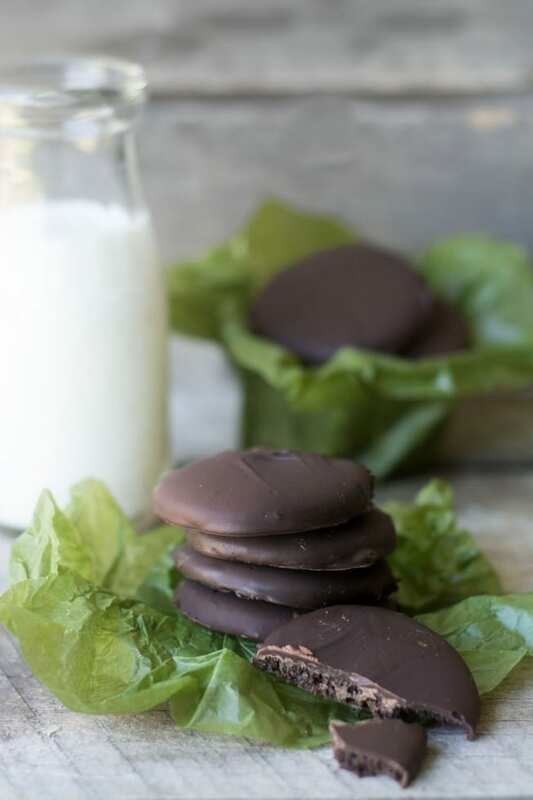 Homemade Thin Mints ~ this is the recipe you’ve been waiting for ~ the perfect copy cat Girl Scout Thin Mint Cookie that is even better than the original! Were you a Scout? I was. But I was something of a rebel. I had stringy hair, wore my uniform skirt hiked up, my tie undone, sash askew, and my badges were sewn on crooked. I categorically refused to wear the beanie. It was the early 70s and that’s how we rolled. Both my daughters were Girl Scouts too. So I have ALOT of experience with Girl Scout cookies. I’ve schlepped them, loaded them, unloaded them, stacked them, stored them, inventoried them, counted, miscounted and recounted them, foisted them off on sold them to friends, relatives, and unsuspecting passers by, bribed teachers with them, gifted them, regifted them, froze them, thawed them, used them as dog treats, and of course eaten them. Many, many, many of them. Lets just say I don’t have the purely nostalgic associations that some of you might have with these cookies. Even so, when I came across this wacky scheme to make Thin Mints from scratch, I was intrigued. It might have had something to do with the fact that I was stuck inside all day during a freak March blizzard. But Thin Mints are truly unique cookies. They’re the all time top seller for the Girls Scouts, and people have been known to hoard them in their freezer. Couple that with the fact that no commercial bakeries are allowed to market them, and you’ll understand why I jumped on this one. It’s not often that a recipe hums along, step by step, without a hitch. Especially when it’s a copy-cat recipe that depends on an exacting replica of the original. The color, shape, texture and taste of these cookies was perfect. Eerily perfect. I can tell you without hesitation that this is the perfect Thin Mint recipe. If you’re one of those people who loves Thin Mints, put your face right up close to the screen and listen carefully…run, don’t walk, to the nearest store to get what you need to make these. Seriously. I could tell the minute I cut out the cookies that something special was about to happen. Even unbaked, the cookies already look like they’re going to be the perfect Thin Mint. An added bonus is that the dough itself is wonderful to snack on, and there are LOTS of little leftover bits in between all those perfect little circles! I tasted one of the cookies just out of the oven. Still perfect. I was getting really excited. By the time I dipped the cookies in the peppermint infused chocolate I was positively giddy. These are exact replicas of Thin Mints. Clones, actually. I think I just earned my cooking badge. Cream butter until light and fluffy, then add the powdered sugar and mix until combined. Stir in the salt, vanilla and cocoa powder. Mix until the cocoa powder is integrated and the batter resembles a thick frosting. Add the flour and mix just until the flour is combined, making sure to not over mix. Form dough into a ball. Knead a few times to bring together, then flatten into a disk between half an inch and one inch thick, cover in plastic wrap then place in freezer for 15 minutes. Remove dough from the freezer and roll it out really thin on a floured surface, about 1/8-inch. Cut cookies using 1 1/2-inch cutter (I used a small cordial glass that measured almost 2" and it was the perfect size). Be sure that your butter is truly at room temperature before you start. If your butter is cool the dough will not come together well. Use the ‘fluff and scoop’ method to measure out your flour. That means fluff up the flour in the canister or bag to loosen it BEFORE you scoop or spoon out your measurement. Level the top of the measuring cup gently with the back of a knife to get the most accurate measurement. This goes without saying, but use a measuring cup meant for dry solids, not liquids for measuring flour. Some people are having trouble adding the peppermint extract to the melted chocolate. I have updated the recipe to add a bit of vegetable oil to the chocolate, this should help. You can also try putting the extract right in with the chocolate before melting. Remember everything must be clean and dry, with no moisture in the bowl, and you must use an oil based flavoring, so definitely read the labels on your peppermint extract. Candy flavoring oils are also a good choice. I used McCormick’s Pure Peppermint Extract. If you can’t find it in your grocery store you can buy it from Amazon, HERE. 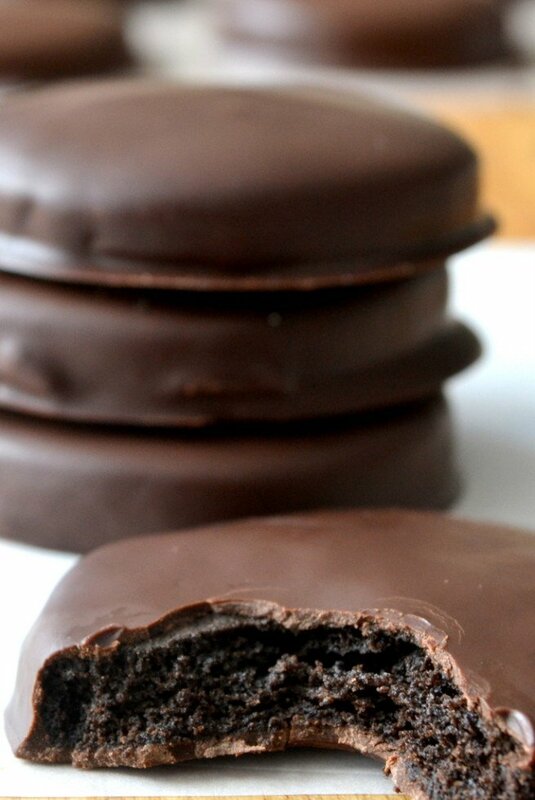 Don’t forget to pin these Homemade Thin Mint Cookies! I made these with my kids, what fun! I ended up addidng about 2 tbsp milk to the dough, as it was pretty dry at first. We also put our own twist with dinosaur, flower, and star shapes rather than circles. Delicuous! Just found this recipe looking to do some new things for the holidays… But I do SO many cookies I like to spread it out over the month. Will these hold well in the freezer for a few weeks until Christmas?? Just a little humor here, when I looked quickly at the 2nd picture, I thought you had them on lettuce leaves….huh…why cookies on lettuce? Other people have thought that too lol! I thought the same thing! Funny! Not having read all the posts, this may have been covered already. The reason people are finding this so bitter could be because you say to use semi-sweet “baking chocolate” instead of regular semi-sweet chocolate, like chocolate chips for example. Baking chocolate has no sugar, and is horribly bitter on its own. There has to be a balance of something sweet, like sugar, to offset the baking chocolate. Hope this helps. Thank you, Abby! I am sure this will save me from having this problem! I just made this recipe today for an Easter treat. Unfortunately, they came out extremely bitter- not good at all. Well, I can’t say ‘not good at all’ because my Dad LOVES them- but myself and the rest of the family do not. I am wondering if I did something wrong, but I followed the directions exactly. Because we are sensitive to bitter tastes over here, is there any way you think I could make them sweeter next time? Maybe adding sugar to the cookie dough batter? Using sweeter chocolate for the dip? The only thing different from your recipe is that I used Hershey’s cocoa powered brand. They look great, hopefully I can match the taste next time I try them. Sorry they weren’t to your taste Annette, people have very different opinions when it comes to chocolate. You could definitely up the sugar in the cookies, and maybe you’d prefer a milk chocolate coating, which tends to be sweeter, too. I used the semi-sweet. (Sorry for the late reply #1yearlater). My grandma loves the original batch I made last year. I am going to make another batch for this Easter with the changes Sue suggested. Just made these using Gluten Free all purpose flour (bob’s red mill). They are fabulous!! My husband loves them! That’s so great to know, Kelly, I bet you’ve just made a lot of people happy! Thanks for the feedback Ana, I appreciate your taking the time to let us know! Hi, I tried to do the chocolate for dipping and as soon as I added the peppermint extract to the melted chocolate, it turned into sludge. Thick, unusable sludge….any suggestions? I revised the recipe to mention that you can, if you have trouble, add a little vegetable or coconut oil to the chocolate before melting. Chocolate is fussy, and will ‘seize up’ if there is even a drop of moisture that comes in contact with it. Be sure you use an oil based extract, too. I was very excited to make these but after I tasted the baked cookies (like a lot of other commenters) I found that it was extremely bitter, I thought dipping in chocolate would help mask the bitterness and it did a little bit there is still a terrible bitter after taste. And no I don’t think I’m extra sensitive to bitter taste I think it must be something in the recipe since me and and many others experienced the same problem. Ive never been sooooo frustrated in my life than making these ? they were hard so so so bitter ? Thanks for such a great recipe! I made these the other day and my hubby went nuts for them. We have barely gone through the first batch and he is asking me to make more. I did do a couple of things differently though…I thought I had enough cocoa in the house, but I only had 3/4 cup of regular cocoa (not dark), which turned out to be more than enough. Maybe if people are finding the cookies bitter, they could try this amount of regular cocoa instead. I didn’t have any baking chocolate and I don’t own a microwave, so I used 3 cups of semi-sweet chocolate chips and a double boiler. The double boiler ensures the chocolate melts easily and stays smooth and thin enough for dipping. We are going to try the Tagalong cookie recipe soon. I have never had them, as they don’t sell them in Canada, but they sound delicious. my boyfriend and I made these tonight and unfortunately they did not taste good. They looked delicious, but we’re so bitter we couldn’t even finish a cookie. Not sure what went wrong since we followed the directions exactly and they looked fantastic! Should we have added more sugar or something? We still had fun making them though! When you cool the baked cookies, do you remove them from the baking sheet to the rack? Yes, I usually let cookies cool for a few minutes on the pan, and then remove them and let them finish cooling on the rack. Hi. Really confused. I’m making a second batch of the cookie part, but it still tastes to bitter. idk what’s going on! 1 cup cocoa powder, 1 cup powdered sugar… i don’t know…… i added a lot more sugar to the first patch, but after baking, the after taste is still there. i was hoping that maybe after i coat them with chocolate they will taste better?? you also said the dough taste good by itself, but heck no, this was just too bitter :( please help me! You may be extra sensitive to bitter tastes, Sarah, I’m not sure. They will definitely taste sweeter after you coat them with the chocolate, so hopefully that will help you! eeeek! I am probably am. I’m going to go through with these cookies and hope other people like them lol, thank you! You’re welcome…it’s always hard to help when I can’t be there in person :) I hope you like them better when they’re chocolate coated! So excited to make this recipe, I love Thin Mints! When you say “vanilla” are you referring to vanilla extract or something else? Thanks! Vanilla extract, Kristen — hope you enjoy them! Hi Aldine — well, I don’t think it’s so much a matter of staying fresh, as it is a problem with the chocolate melting. I know companies won’t ship chocolate during the warm months because of this problem. In any case I would ship them as quickly as possible, and hope that the temp stays low! Hi, thank you so much for having this recipe on your blog. I found you through Pinterest. These came out wonderfully! I used a double boiler to slowly heat some bittersweet chocolate chips (65% cocao) with oil based peppermint extract, because of the bitterness of my chocolate I ended up using about a tablespoon of the extract to get the flavor I was looking for. I also used 100% whole wheat in the cookie mixture, my cookies were brittle when they first came out of the oven (due to the high butter content I believe) but I let them cool on the pan and once they came to room temperature they were fairly structurally sound. I was able to dip with minimal crumbs.The recipe yielded 56 cookies just under 2″ in diameter for me, but I only had enough chocolate chips to coat half of them so I would have needed about 20 oz to coat all the cookies. Overall I am very pleased with the recipe, thanks again for sharing it!!! I loved these! I did have some issue with the dough being so dry so I added about a tablespoon of coffee that I had brewed this morning to bind everything together. Instead of making the “cookie” , I use Ritz crackers. Works wonderful!! I just made these tonight. They are very good, though not Thin Minty enough to call them the same. Reasons could be: I didn’t have dark cocoa so used regular (something about that always seems to come through in recipes…you can almost taste the powder), while my chocolate dip didn’t seize up, it wasn’t thin enough to dip – I ended up having to make a second batch of the dip to get them all covered. Not sure how to make it thinner – suggestions? I used Ghiradelli semisweet baking chocolate the first time around and Cadbury’s Dark Chocolate for the second batch. No difference in consistency between the two. I would make them again, but sadly I don’t see them as a substitute for Thin Mints. 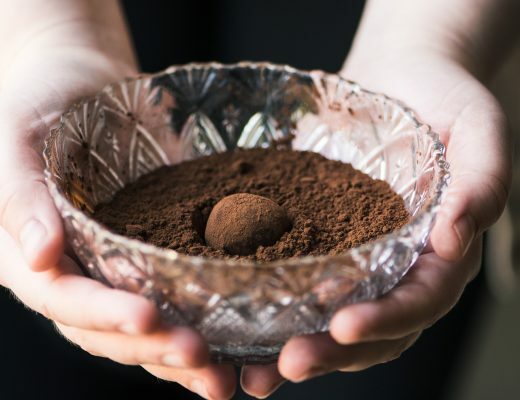 use paramount crystals to thin your chocolate…. The first time I made these, they were really crumbly, dry, and terrible. After rereading the recipe a billion times, I found it. This needs two sticks of butter (I read the 8 ounces as 8 tablespoons) if y’all had the same problem. I just rewrote the ingredient so it’s extra clear, I’m so glad you kept at it! I’m actually planning to revisit this recipe and rework through it in light of people’s problems. I think it’s a good example of how reading (and writing) a recipe is tricky. Thanks for sharing your experience, Lisa! I see a lot of people had problems with the chocolate, but that was the only part that worked for me! I was a bit freaked out with the dough but I continued with it and it turned out right. I baked those perfect little circles and I was so excited that when the first set was cool i ate one plain…and it tasted terrible!! I have no idea why :( I followed the recipe exactly and it all looked perfect. I even went ahead and melted the chocolate thinking the unsweetened cocoa powder would be ok covered, but it was not :( any idea what happened? Are you sure you added the powdered sugar to the cookie dough? That’s the only thing I can think of, because with the sugar you wouldn’t have any unsweetened chocolate taste. Hope this helps! I’m not sure what I did wrong, but when I tried to make these tonight, they turned out as a big flop. :( The dough was extremely dry, and crumbled to bits when I tried to roll it. I got it back together by adding some water, but after they were cooked, they were dry and still crumbled apart. When I went to make the chocolate and peppermint coating, the moment I added the extract to the chocolate, it seized up to the point where it was impossible to dip anything into it. I ended up spreading it on as a frosting, but the pressure of doing that ended up making a lot of the cookies crumble to pieces. :( Needless to say, I was really disappointed. Sorry you had a bad experience A.G., this recipe is fairly complex, and with any baking project little things can go wrong. Sometimes the way you measure flour can make a difference, for instance you should always fluff the flour first and then lightly spoon it into your measuring cup, then level off with a knife. I hope you get a chance to try these again, they really are wonderful! I had all the exact same problems, and I followed the recipe to a T!! I have been baking a while, so knew what I was doing, but for some reason this recipe and I did not mix. They still tasted good, just wasn’t enjoyable to make :( I was disappointed as well. When I found this, I was SO excited. I’m like the biggest thing mint fan and to be able to make them? Heaven! I decided to make them today! However, I was so disappointed I didn’t read the latest comments about the chocolate seizing… Mine did just that with McCormicks peppermint extract. It wasn’t runny enough to dip the cookies in. I also must have done something wrong with the dough. I followed the directions exactly but they came out very bitter and crumbly. It tastes like too much cocoa, not enough sugar. Not sure why, since I added the right amounts. I can’t vouch for my baking skills, but I’m not so inept that I can’t follow directions. Really disappointed that I couldn’t do this. Biggest waste of 3 hours and a bunch of ingredients. I just made these, I thought I was going to have the seizing problem everyone else had, (I used off brand chocolate chips, and the peppermint extract everyone else had) But with the right blend of heating and added milk, they turned out great! as to the seizing I used chocolate chips and it worked fine. When you put them in the microwave heat them up for 15 seconds ,stir them amd then add the peppermint extract and stir.Continue at the 15 second intervals until your chocolate is melted ,stirring in between. Hope this helps!! Good advice, the short bursts in the microwave are key to melting successfully! Heres the thing. These are freaking ridiculously close to the actual thin mints. Like, I’ve eaten atleast a zillion. I had Wilton Dark Cocoa Mint melts so I used those. Then when I ran out I used some andes baking chips melted with some shortening. SO GOOD. I popped them in the fridge for a bit. I like thin mints cold. Maybe because I usually eat them from the freezer. I mean, this recipe makes me feel bad for girl scouts. I’ll never have to buy again! Also, these would be a fantastic Christmas gift…it makes a TON like 2 or 3 gifts easily! I had bought peppermint extract to use, and my 16 month old totally hid it on me. But after reading the comments about seizing and asking King Arthur Flour (they recommend using flavoring OILS so chocolate doesn’t seize) I’m glad I happened to have the Wilton Melts-which were delish….and the andes baking chips were just as great so why not! Thank you for the recipe. I found you on pinterest and I’m delighted! Looking for something simple, take a Ritz cracker, bag of Andes Mint Chips (the one in the baking aisle for cookies). Melt the Andes Mints down and coat the entire cracker, let set on wax paper and enjoy. You’ll find this taste very much like a Girl Scout Thin Mint also. Hint: 2 Bags of Andes Mint Chips will just about do 1 box of Ritz Crackers. I made these tonight and am disappointed :( i was really hoping these would be perfect, the directions seemed so easy! The cookies part had GREAT flavor, but they didn’t harden properly. Instead of being crisp/hard, they were semi-firm and crumbled if you weren’t extremely gentle with them (which is hard to do if you have to dunk them in chocolate). Then, when I made the coating, the melted chocolate instantly thickened to almost icing-consistency as soon as I added the peppermint extract. Needless to say, I wasn’t able to coat the cookies, but instead iced them like sugar cookies. Again, the flavor was great, but the cookies did not hold up. I’m not sure how this went wrong—I was very meticulous with the instructions and ingredient list. Any idea why this didn’t turn out?? Possibly the cookies were rolled too thickly? I just laid my cookie on a fork and dipped them into the chocolate that way. As for the chocolate, make sure you don’t overheat it, and make sure you have oil based peppermint extract. Hope you give them another try! I have a nephew who has severe nut allergies, and now all the food companies are putting that nut disclaimer on their labels—it’s getting hard to buy anything nut free! I didn’t have enough chocolate to do a full coating on all since I had to throw the seized stuff away, but did a drizzle on the rest. Looking forward to tryin them! I take the chocolate and melt a couple of chunks in a double boiler and then add the peppermint extract once melted, then continue to melt the rest of the bar. Once meted, dip crackers into chocolate, freeze and enjoy. We keep them in the freezer. Wow, Ritz crackers are pretty amazing. I’ll try it! Hi Sue, thanks for posting your recipe. My partner is determined to make this recipe work, despite two unsuccessful attempts. I thought I would clarify something with you and see if I could help her out in the kitchen. While your recipe calls for peppermint extract, it seems like it would make more sense to use a mint candy oil. I say this because upon adding the 1.25 tsp extract to our pure melted chocolate, the melted chocolate seizes. This makes sense because extracts with alcohol-based solvents burn at lower temperature and should cause melted chocolate to seize. The cookies look scrumptious – please confirm the ingredient you used so ours turn out exactly like yours (alcohol-based peppermint extract OR mint candy oil). Well, I used the extract that I found at my regular supermarket. I’m not at home right now or I would go to the cupboard and get the name for you, I’ll update with that later. I don’t know why the chocolate seized, but maybe the type of chocolate makes a difference. I used Baker’s Semi Sweet Chocolate Squares, if that helps. But I’m sure the candy oil would work just as well. I had that problem too, with my chocolate seizing. I had picked up “peppermint essence” at the store (not knowing the difference). The ingredients in it are: glycerine, alcohol, WATER, and peppermint oil. That’s the problem right there! Personally I’m a fan of the old Thin Mints with the vanilla cookie on the inside so I’ll be trying these but tinkering just a little to see if I can recapture those from my childhood. Thanks for sharing.. I had no idea they used to make a Thin Mint with a vanilla cookie—that sounds really good…let us know how it comes out if you try! I was a Girl Scout in the 80’s with a 60’s garage sale uniform, and I DID wear that beanie, even though I was made fun of for doing it. 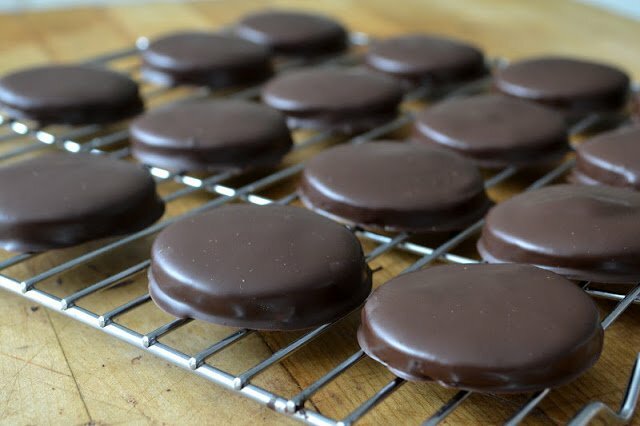 I just made homemade peppermint patties recently, and I was thinking I had to find a recipe for thin mints (I had seen some before) after making those. I happened upon yours from WFMW, so I’ll be making this recipe. I know what my mom is getting for her birthday! Hope your Mom loves them, and you were pretty brave for wearing the beanie, it wasn’t the most attractive aspect of the uniform! I was mocked relentlesly. I still want to know how 9-year-olds knew to call me a member of the Green Berets. Seriously–do they go home and ask their parents, “How can I make fun of the Girl in the Girl Scout uniform at school?” What 9-year-old has heard of hte Green Berets? I was the only girl in my entire school who was a Girl Scout. On the plus side, I was the first one to sell cookies in my town, and I outside all of the girls in my troop who lived in another town. That’s one great reason for trying these, they won’t have anything in them that you didn’t put there! Let me know how they come out! I’m so excited to try these. Thin Mints were always my favorite Girl Scout cookie until I became chemically sensitive and couldn’t eat these any more. My mouth is watering just thinking about them!! Thanks so much!!! Remember folks, the Girl Scout cookies are produced by a commercial bakery that makes their dough with lard instead of butter and the chocolate for dipping has parafin to make it solidify quickly and stay solid under a multitude of shipping and storage conditions. Of course homemade is better even when you don’t have visual perfection you get taste perfection. I didn’t know about the lard, but the better quality chocolate coating in the homemade really does make a difference! Seriously, no commercial bakery uses lard. It’s too expensive, for starters. It’s this kind of irresponsible rumor-mongering that causes all sort of headaches. I made these, and they were pretty good, but I wouldn’t say they are exact clones. I had to use twice as much semisweet chocolate and peppermint to dip all of the cookies. Yum! What a great idea! If you can make mint thins at home I’m sure you could make Tim Tams too! Now I’ve got to ‘Goggle’ Tim Tams! I’ve recently been having a massive craving for thin mints so I was very happy to find your recipe! I made these last night, but had to cut the ingredients in half (except for the peppermint extract) since I was low on butter and didn’t have any vanilla. Despite that, they still turned out great, only problem that even with over 2 teaspoons of peppermint extract they don’t taste very minty to me. 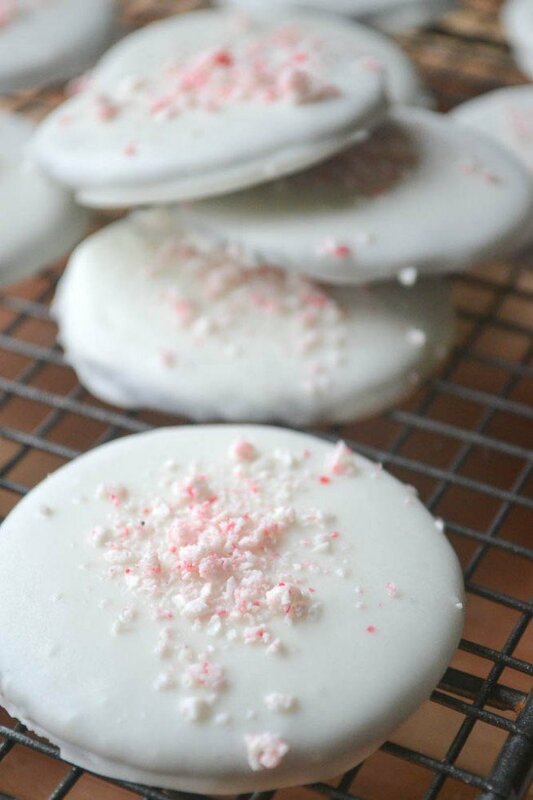 I think next time I’ll try putting the peppermint in with the cookie mix instead of the coating for a real minty kick! I just found your recipe here. My sons are going to be so happy. These are their favorite cookies. Fantastic! Maybe they can make them with you, Mireya! YES!! This recipe is a find, and I’m so glad to have found it on Pinterest. I’m in love with Thin Mints. (Plus, now I can make them gluten free with my own flour.) Thanks! I’m fascinated to know if you can make a gluten free version, Pam, let me know how they turn out! just what I was looking for. What is the lemon juice for? These are awesome! I made them with my 7 year old daughter today and she said that you definitely captured the spirit of the cookie :-). I couldn’t agree more! Thanks for sharing the recipe! So glad they worked for you, I think it’s the perfect project to do with kids, especially if they are scouts themselves. i gotta try these! They’re not selling right now, and these are my favorites! That’s the beauty of these, when your freezer ‘stash’ runs out, you can make them yourself! These look amazing! My family loves these cookies. I think that I will have to make these very soon. They look so yummy! lol! I forgot about that, I used to eat a whole sleeve at one sitting, too. I just made these tonight. With my level of kitchen competency, it was a big mess and took a long time, but I can’t wait for them to set and try them. How did I miss this post???? These look fantastic. So creative and beautiful. Really outside the box :) I was a girl scout as well and loved selling cookies. I loved to freeze the thin mints and eat them cold. Thanks for taking me back! After almost a year of seeing this little post on the right side of your blog, you know … at the top … the most popular recipe … ever? You know what I’m talking about. It has haunted me – and the time has come. I need to make these this weekend and hope you don’t mind! I’m going to post it and link to you sweet Sue! I made them last night. The dough made roughly 2 dozen but I ran out of the dip before I could get them all. They atelier very good and would make them again! I was a Girl Scout, and I think my mom still has my sash full of badges somewhere. 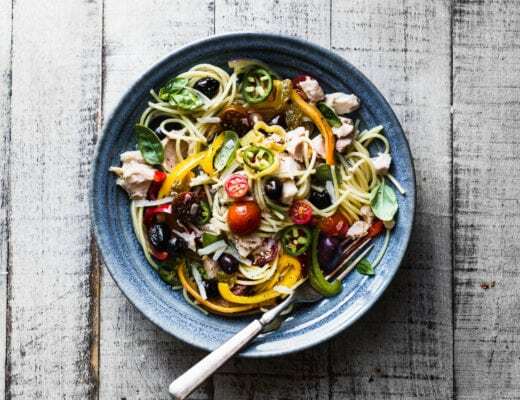 This recipe looks too easy not to try! Can’t wait to give it a go! I think you earned that cooking badge a long time ago. Thin mints are not my favorite cookies, but my mom and daughter love them. I just might surprise them both with a batch of there beauties. Mandygirl—I used Baker’s semi sweet baking squares and a bar of Ghirardelli semi sweet baking chocolate, and I was surprised at how thin it melted up. I’ve had trouble before with melting other chocolates. I melted it in the microwave, too, if that helps. I’m glad they were good, anyway! Mandy—It made about 2 1/2 dozen,give or take, depending on how you roll and cut your dough. I’ll update the post, thanks! Ah these look great, Sue. My mom just emailed me telling me she bought a box of the thin mint cookies and she couldn’t even eat them because she’s been “spoiled” by the ones I made back when I was at home–homemade is always so much better, isn’t it? I really want to try this recipe out to compare to the Heidi Swanson ones I tried out… so curious! Thanks for sharing! The cookies are AWESOME! but I had trouble with the chocolate…I did it exactly like you said with baking chocolate and it never got thin enough for me to dip…so I had to resort to a minty layer and then dipped in candiquick to give the hard coating…but oh my…SO GOOD! I had that problem too. I think the issue was that my peppermint extract wasn’t pure oil, and it had some water in it. It made the chocolate seize and less drippy. Not so pretty, but still tastes like heaven. MAGNIFICENT! these look so similar to the real thing, and the taste can’t be too far off either. bravo! They look just like the real thing. HI Sue! These look awesome. My daughter wants me to bake these for her class party. How many cookies did this recipe make? I am thrilled to find this and your blog. I bet this put store bougt to shame. Can’t wait to try! I’m just tickled pink to have this recipe! 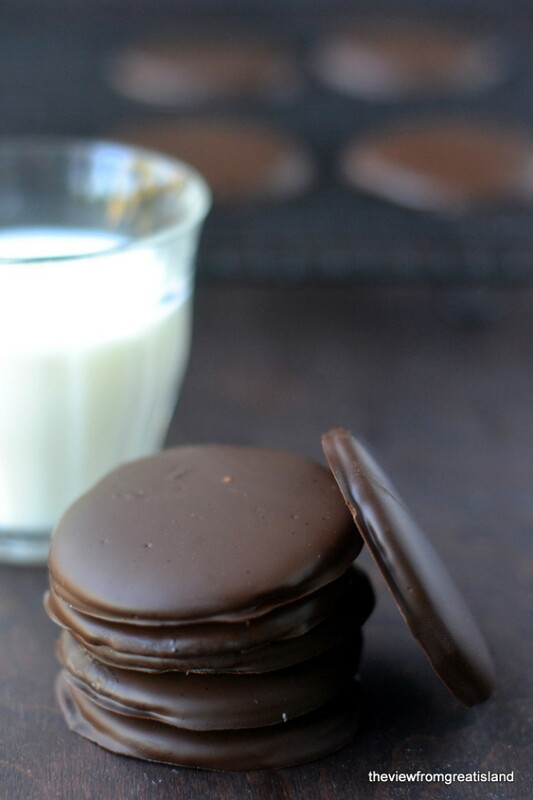 Thin mints are our favorite Girl Scout Cookie and can’t wait to make them at home. Thanks for sharing. 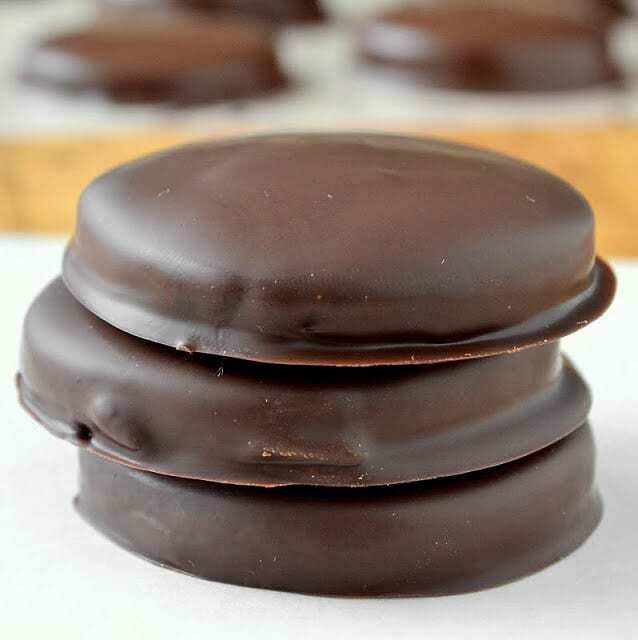 These are the best homemade Thin Mints I’ve ever seen made. Wow. You are talented! I highly doubt that my attempt would even resemble that famous cookie. The only Girl Scout cookies I like are the Thin Mints, so I must try this recipe. The homemade version has to be even better!! Thanks for sharing the recipe. I am impressed that you made these cookies and they look so perfect! I was not a girl scout. Grew up in the middle of Kansas and 4-H was the thing. Respect. Need I say more?!! These are perfect thin mints. I am enjoying your blog so much. Thanks for stopping by. I am now a follower. Oh my, these look absolutely delicious! Love thin mints. I wasn’t a girl scout, but my niece was, and I sold, and sold, and sold them for her at work! My biggest sale was 300 boxes! Which I schlepped into Boston on the train . . . during the course of a week! 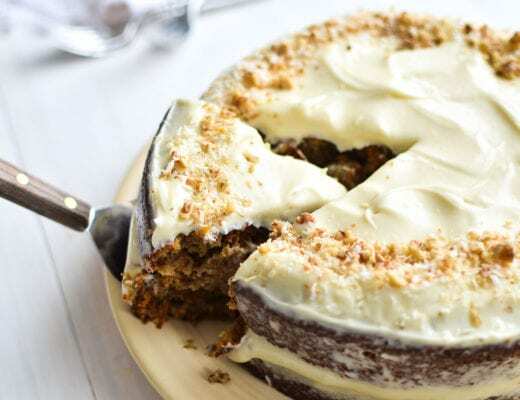 I may give this recipe a try for St. Paddy’s Day! Yeah… I’d get giddy too. LOL They look YUMMY! These look Beyond delicious! I could easily the entire batch. I think you just earned your cooking badge too! I seriously can’t believe you made these…well actually since it’s YOU, I can. Seriously they are so perfect it’s like they came off an assembly line in a factory…in a good way…I hope you know that. Sue, these are PERFECT! My kids would go nuts for these gems! Aw! How nostalgic! The thin mints were always a favorite behind the Samoas. Thanks for sharing the recipe. Those put the girl scout cookies to shame! That coating of chocolate looks heavenly! I have to admit, I’m not a girl scout cookie kind of girl. Homemade is always so much better, isn’t it?